March 1982. He caught on right away. Just a few months later, he was in his own title. Arion, Lord of Atlantis #1 was dated November, 1982, while in the back pages of that month's Warlord, "The Barren Earth" debuted. Arion was a magic wielder, like Lando, Sargon and other DC characters, but without the stage magician get-up. He was also Atlantean royalty, from tens of thousands of years ago, when Atlantis was above the water, and already had an ancient civilization. Furthermore, he was immortal, and therefore capable of ruling the land for centuries. He was involved early on with the Lords of Order and Chaos, who also figure strongly in the back-stories of Dr. Fate, The Hawk & the Dove, Amethyst and other DC series. Arion and his supporting cast, including Lady Chian, the love of his life, were created by writer Paul Kupperberg and artist Jan Duursema. Kupperberg was a DC regular, also associated with that company's version of The Peacemaker, a 1980s revival of The Doom Patrol and similar heroes. Duursema also has more credits at DC than elsewhere but has also done some work on X-Men and the Star Wars franchise when the comic book version was being published by Dark Horse Comics (Concrete, Hellboy). Being immortal, Arion survived to the present era. After Crisis on Infinite Earths rendered Power Girl's origin as Superman's cousin no longer viable, he was brought in as a substitute source of her super powers, but that eventually proved non-viable as well. He was involved in a giant crossover series in which a lot of DC's magic wielders got together to rebuild Captain Marvel's Rock of Eternity after it was destroyed by The Spectre. He's since relinquished his immortality, and is currently dead — but with superheroes, that's always subject to change. Arion's comic book lasted until #35 (September, 1985), still written and drawn by Kupperberg and Duursema. 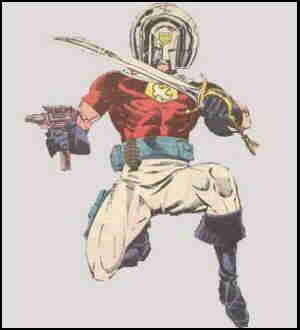 In 1992, he was brought back in a six-issue mini-series, Arion the Immortal. The artist was Ron Wilson, who has done a lot of work for Marvel, including Captain America and The Hulk. The formerly-immortal Atlantean hasn't had a regular series since then, but like The Elongated Man, Metamorpho and any number of other minor denizens of the DC Universe, is liable to turn up anywhere. Text ©2008-10 Donald D. Markstein. Art © DC Comics.